“Where were you when the world stopped turning, on that September day?” These are the lyrics from Allan Jackson that we all reminisce on every year on this day….September 11. 17 years ago, 246 people went to sleep in preparation for their morning flights. 2,606 people went to sleep in preparation for work in the morning tomorrow. 343 firefighters went to sleep in preparation for their morning shift. 60 police officers went to sleep in preparation for morning patrol. 8 paramedics went to sleep in preparation for the morning shift of saving lives. None of them saw past 10:00 am Sept 11, 2001…. In one single moment life may never be the same. OUR lives were also changed! We are part of a country that has so much pride – yet so much hatred at the same time. We are PROUD to be Americans!! How do you show your pride? By “taking a knee“….however that looks? Or do you STAND TALL in the face of whatever our country stands for? 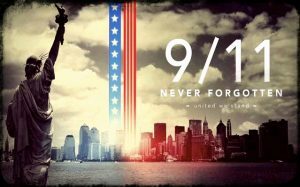 I wonder…..if “September 11” were to happen today, would we again stand UNIFIED and STRONG? Or would it be dependent on your skin color, your birth place, your religion? 9/11 brought Americans to their knees – not because of the buildings that were lost – or the planes that were crashed….it was because of the LIVES that were lost and the families left behind. Our HEARTS were hurting for their loss and we came alongside of them – UNIFED! It is in that UNITY that we can find courage, hope and resilience to rise again – banding together in love – all to make The United States of America a better place!! Here at Great Plains Consulting, we look forward to serving YOU in finding the right opportunity to fit your talents and abilities within the Agriculture Industry! And we stand tall in saying – MAY GOD BLESS AMERICA! !